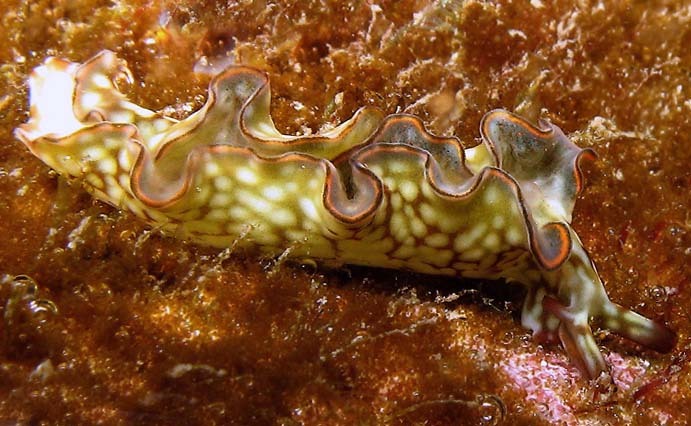 Dark red maculated with spots of creamy green which impart a reticulated appearance to the animal; parapodia margined with orange and purple. 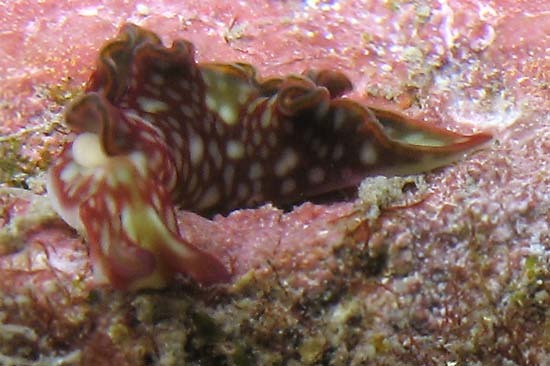 Rhinophores long and slender, directed anteriorly, dark red tipped with purple. E. rufescens, has been rarely reported from the western side of the Indian Ocean .Terry Gosliner's report of a single animal from the Indian Ocean coast of South Africa (Gosliner, 1987). 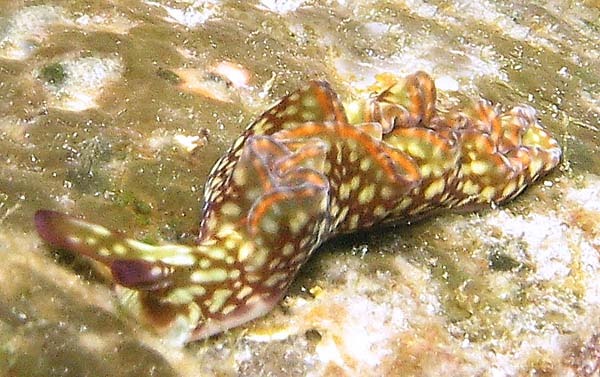 The animals are usually found on the sides of rocks in shallow waters shoreward of fringing reefs where they crawl over assemblages of algae. In Hawaii, E. rufescens eats Bryopsis pennata and, from limited collecting experience, is rarely found very far away from it. They have found Bryopsis plastids in the digestive cells of E. rufescens. According : Department of Chemistry, University of Hawaii at Manoa, Honolulu 96822 , USA ( 21 November 2001). 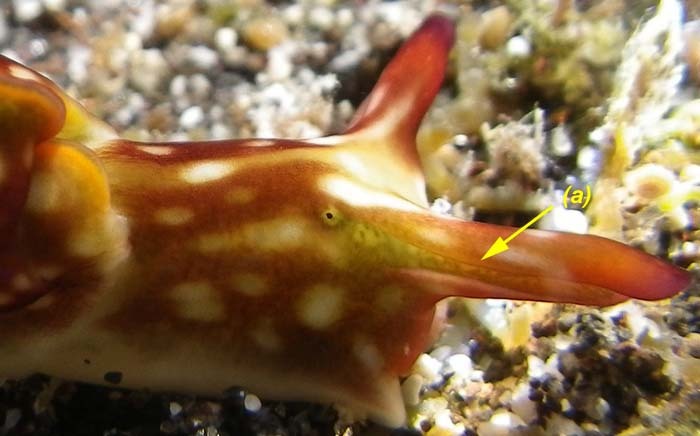 # Sacoglossans are a group of opisthobranch mollusks that have been the source of numerous secondary metabolites, there are few examples where a defensive ecological role for these compounds has been demonstrated experimentally. # Bryopsis sp. produces kahalalide F, a major depsipeptide that is accumulated by the sacoglossan. They show that kahalalide F protects both Brvopsis sp. and E. rufescens from fish predation as indicated by the deterrent properties of their extracts at naturally occurring concentrations. 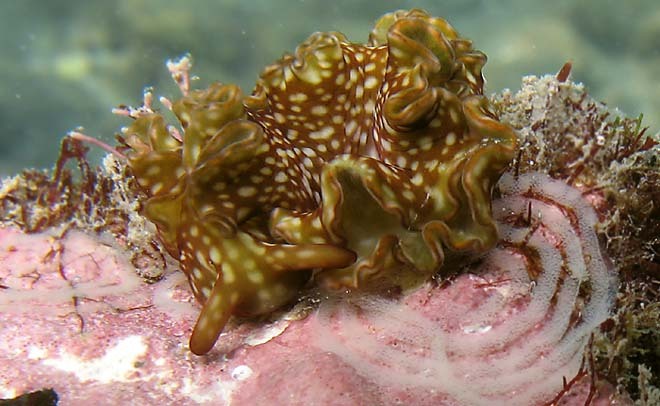 Kahalalide F, a novel marine-derived anti-tumour agent isolated from the sea slug Elysia rufescens displays both in vitro and in vivo anti-tumor activity in various solid tumor models including breast, colon, non-small cell lung, and in particular prostate cancer. Kahalalide F is currently undergoing Phase II clinical trials in various solid tumours: melanoma, non-small cell lung cancer and hepatocellular carcinoma. It was 1.25 inches long. Found at Tahiti. 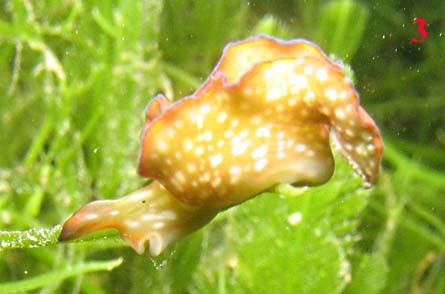 The most obvious characteristic distinguishing sacoglossa (externally) from other nudibranchs are the two rolled rhinophores (a) on the head. Eating algae, just before the sunshine ? According Bill Rudman : "I can't be sure it is feeding in your photo, but Bryopsis, which it is reported to feed on, is often present as fine green filaments which are hard to see individually. " 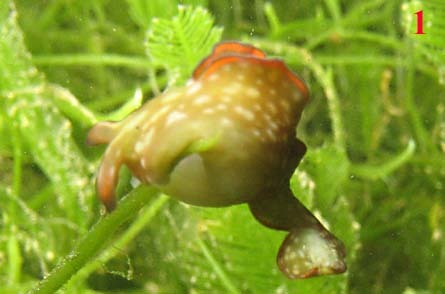 We observe several specimens of this species with E. ornata and E. sp1 in the lagoon during this period. 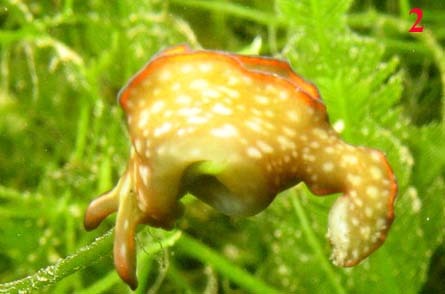 A small specimen with the dark red body maculated with spots of creamy green.